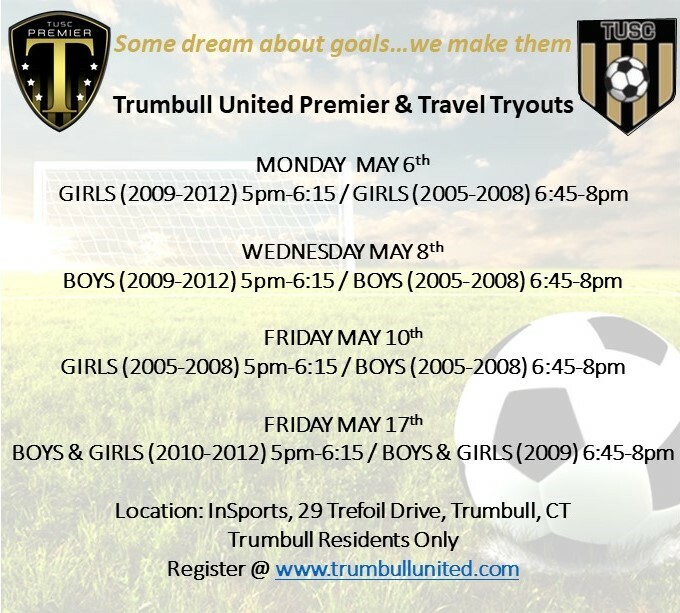 Trumbull United Soccer Club is excited to announce tryouts for the upcoming Fall 2019-Spring 2020 season. There are two (2) tryout sessions for each age group. The schedule with specific dates, times and locations per age group is below. All players (new and returning) must attend tryouts in order to be considered for placement on a team. If your player is unable to attend one or both of the scheduled dates, please contact . The fee for Travel teams is $1225. This includes Fall, Winter, and Spring seasons. The fee for Premier teams is $1625. This includes Fall, Winter, and Spring seasons. The following information must be provided by all players (returning and new) during the registration process. A Medical Authorization & Injury Release Form. Players will not be permitted on the field for tryouts unless a Medical & Injury Release Form is completed by a parent or guardian and on file. This form will be completed online as a required part of the registration process. A current photo of the player (head shot). A head shot photo is required for player and coach passes and can be uploaded during the registration process. Please provide a HEAD-SHOT picture as this will end up as a small 1"x1" image on a pass and it needs to be clear. A copy of the player's official government issued birth certificate or passport. This is a Connecticut Junior Soccer Association (CJSA) requirement for proof of age. A copy of the birth certificate can be uploaded during the registration process.